The 2018 Mazda CX-5 is Mazda’s entry in the compact SUV category. Among Mazda SUVs, it slots between the subcompact CX-3 and the mid-size CX-9. As the best-selling Mazda SUV, the CX-5 continues with its unique combination of ride, handling, sophisticated style, and overall driving pleasure. The 2018 Mazda CX-5 comes in three trim levels: GX, GS, and GT. The GX and GS trims come standard with front-wheel drive, with all-wheel drive optional. The GT comes standard with all-wheel drive. Pricing starts at $25,800 for the GX and ranges up to $35,000 for the GT. Mazda CX-5's SKYACTIV-G 2.0L and 2.5L engines have both received updates to improve real-world fuel consumption. The real outstanding engine is Mazda's cylinder-deactivation technology in the 2.5L engine. This lets it shut down the two outside cylinders at cruising speeds to maximize efficiency. Cylinder deactivation is more effective at low speeds, improving fuel economy by approximately 20% when driving at a constant 40km/h, and by approximately 5% at a constant 80km/h. Mazda is the only automaker to offer a four-cylinder engine with cylinder deactivation in North America. The new 2.0L engine is standard on the GX, paired with a six-speed manual transmission. The available six-speed automatic transmission is paired with the new 2.5L engine that delivers 187 horsepower. The CX-5 GS and GT trims add the new SKYACTIV-G 2.5L with cylinder deactivation as standard equipment, paired exclusively with the 6-speed automatic transmission. 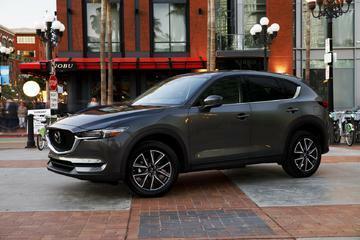 All CX-5 models sold in Canada are available with Mazda's predictive i-ACTIV all-wheel drive. It comes as standard equipment on the GT. The list of new Mazda CX-5 standard equipment for 2018 includes automatic on/off headlights, rain-sensing wipers, and illuminated power windows with driver's one-touch up/down feature. In the safety department, Smart City Brake Support, Advanced Blind Spot Monitoring, and Rear Cross Traffic Alert now comes standard, on all 2018 Mazda CX-5 models. The full i-ACTIVSENSE suite of safety technologies is now available on all CX-5 trim levels. This includes Mazda radar cruise control with stop & go function, smart brake support, pedestrian detection, distance recognition support system, forward obstruction warning, lane departure warning system, lane-keep assist system, high beam control, and colour multi-information display. The entry-level CX-5 GX trim includes G-Vectoring Control, 17” alloy wheels, cloth-upholstered seats, cruise control, air conditioning, push button start, LED headlights, LED daytime running lights, noise-isolating windshield, auto off headlights, electronic parking brake, and a 40:20:40 split-folding and reclining rear seat. 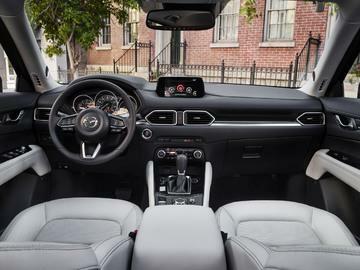 Also, standard is MAZDA CONNECT, with a 7-inch color touchscreen, Bluetooth audio streaming and phone pairing as standard. The mid-level GS adds power liftgate, six-way power driver’s seat, leatherette seating surfaces, heated front seats, heated steering wheel, auto-leveling LED headlights, front wiper de-icer, rear centre armrest with cupholders and two rear USB ports, and auto dimming rearview mirror with HomeLink. The available GS Comfort Package includes power glass moonroof, automatic dual-zone climate control, rear passenger vents, and advanced keyless entry. The i-ACTIVSENSE Package is also available on the CX-5 GS. The top-of-the-line GT starts as a loaded GS and adds on more features, including 19” alloy wheels, leather seating surfaces, heated rear seats, ten-way power driver’s seat with power lumbar support and memory, BOSE Premium Sound System with 10 speakers, navigation system, and Adaptive Front-lighting system. The available GT Technology Package features the equipment from the GX/GS i-ACTIVSENSE Package, along with a windshield-projected active driving display head-up unit with Traffic Sign Recognition, and SiriusXM® satellite radio. The 2018 CX-5 goes on sale nationwide in early December. For its style, its driving appeal, its quality, its safety tech, and its improved fuel economy from its updated engines, the all-new 2018 Mazda CX-5 from Yarmouth Mazda in Yarmouth is the class of the compact SUV field. Contact us for a memorable test drive – once you get behind the wheel, you’ll fall in love!